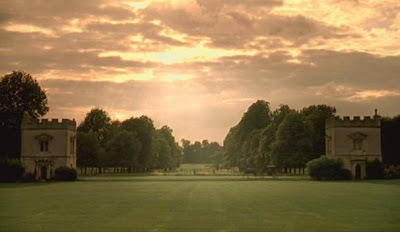 Gentle readers, One of my most popular posts is The Dummification of Mansfield Park, which I wrote in response to the 2007 ITV adaptation of Jane Austen’s novel. In addition, Austenprose has been showcasing Mansfield Park during the last two weeks of this month, discussing the novel at length and giving away prizes. A few days ago, Professor Ellen Moody posted her thoughts on Eighteenth Century Worlds about script writer Maggie Wadey’s recent adaptation of Mansfield Park. Once again Ellen has graciously allowed me to post her thoughts, which add another dimension to the latest Jane Austen film adaptation. I know everyone so inveighs against this 2007 Mansfield Park written by Maggie Wadey (in TV the writer is central) and it’s true the film can be seen as a crude outline of a book through hitched-together scenes. The people in charge of this production had not the time, money, nor inclination to begin to present a proper translation of the book. Against the 1983 Mansfield Park this latest adaptation is a laugh. It also (like the 2008 Sense and Sensibility vis-a-vis the 1995 film by Emma Thomspon) imitates the 1999 Mansfield Park: The presentation of Henry and Mary Crawford is simply modeled on the earlier film version – they suddenly appear as a couple, like a pair of witty dolls. Because of our immediate (and negative) reaction we ignore what is interesting — at least to me. There is a continual atmosphere of menace. One person who commented several times on this film argued that this reaction responded to something going on in Britain right now: a dislike of hierarchy, of artifice, of the older culture of deference. He saw it as deliberately opting for the “natural” in the preference say for a picnic, the eschewing of formality. I can see this but think it’s counteracted by the intense anger that is on the edge of exploding all the time — from the father and the oldest son. The notion of a sensitive temperament unable and unwilling, too gifted and at the same time self-possessed – which partly is in Austen’s characterization of Fanny – is transferred to Edmund (played very well by Blake Ritson). Fanny is presented as subdued because it’s in her interest, not because it’s her nature, and not really because she has been so crushed by the poisonous Mrs Norris. We see her as a tomboy in the opening in a scene taken from Austen’s Northanger Abbey, one which Davies also makes much of in his 2007 Northanger Abbey (anything that can make a woman into a boy is just great; Fanny’s now a horsewoman too, instinctively, not something learned which is what happens in the book and in the 1983 film). An implied bullying is at the core of social life in this movie, which uses parties and little physical tussle games (Fanny with children) to provide momentary relief. Lady Bertram opts out but we are made to feel she could hold her own physically and mentally if she wanted to; that’s what I take is the point of making her say she knew all along that Fanny loved Edmund, bringing the happy ending about. (In the 1999 Mansfield Park the taboo is also slurred over, and Mary Crawford at least knows and repeats that Fanny loves Edmund.) I do think both enactments — a natural world against the formality and artifice of hierarchies and the continual bullying, menaces as central to experience — are in reaction to our time. Sir Thomas's offer of a birthday celebration lacks his usual snarl, but he is saying with implied ability to punish: You must. Similarly and this is a point brought out in many of the essays of the 1970s: this is a novel which distrusts social life, finds it hollow, treacherous, and seeks the retreat of long-known bonds, truthful affection, and yes quiet, stillness, companionship of hearts and minds. Any news from London she says. He replies “none, no excitement [no war, he likes excitement whatever it be and the list is not attractive), but then he condescends to talk of small matters like Maria and Julia “who are tireless followers of fashion,” “even Edmund is at times at Maria’s where you may know my sister is living at present. Mary’s appetite for society remains undimmed.” The implied outlook on this is scathing. But “Tom, on the other hand, is away from all.” Too away but understandably avoiding what Mary’s appetite seeks. He goes on: “Perhaps living there she is no longer alive to its beauty but to me on a day like this it is an uncommon sight.” She replies: “Oh I think so too I can imagine no where lovelier than Mansfield Park.” There is a feeling of menace when Henry asks her to save him from returning to London. There is nothing more natural about the kind of personality Bille Piper projects (or Frances O’Connor in the 1999 MP) than there is in the kind of personality Sylvestra Le Touzel portrays (1983); that is, the person who is maimed and made nervous and in need of support and cannot endure to assert herself publicly, especially when she is asked to pretend to be someone or something she’s not is NOT UNNATURAL. It’s just as natural to be quiet, a reader, thoughtful, and perceptive and able to see the other side (which Fanny does) as it is to be noisy, active, not thoughtful, stubborn, and aggressive. By contrast, The 2001 Aristocrats by Stella Tillyard based on Harriet O’Caroll’s screenplay buys into the sweetness of aristocratic life at the time; it celebrates the artifice and luxury as pleasurable (if overdone in the case of Charles James Fox’s childhood — he takes a bath in cream). We see the sweetness of life during this long lingering nuanced conversation. In the second we are not permitted to see these as enjoyable, but only the bullying stance of those in charge. The 1999 Mansfield Park reveals to us the political outlook of these people (Sir Thomas is a conservative; Mrs Norris a sycophant) and how they prey on the powerless (on the slaves). The key character in the 1999 MP is Mrs Price who cannot escape Mr Price as she tells Fanny when they hear his harsh voice requiring her to join him in bed. She married for love. Please visit Ellen and Jim Have a Blog Too for more posts about Mansfield Park. 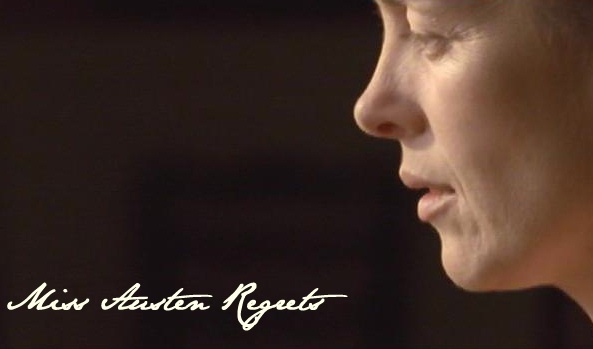 When I read Professor Ellen Moody’s comments regarding Jane Austen Regrets 2007, I realized we were in complete agreement about the movie. She includes historical and literary details that set her essays apart from most movie reviews. Ellen has graciously allowed me to publish her thoughts on this blog. It’s been asked how accurate is this film as a biography. That’s a hard question to answer because it depends on how you read Austen’s letters; and the letters themselves represent a minority of the letters she wrote and they are censored (clipped, abridged, cut — and we all know how one word left out can make a very great change in tone, not to omit literal meaning). I think the real question is how unhappy was Austen’s life. The film presented her as very unhappy basically, even though she had freedom to write. Olivia Williams did the part with great tact and intuition and irony and made the state much more believable than the shallow imbecility (and glamorized victimhood complete with the crew adoring our heroine at the end) of ‘Becoming Jane’. We should recall first that (as Mary Lefkowitz among others in her lives of the classic poets says), it’s common for popular biography to present the life of a genius in any area as miserable; she suggests this comes out of envy, a desire for compensation (that is, most or many people’s lives are thwarted and unhappy and it makes them feel better to see the genius suffer too, a sense of alienation from someone different) and her classic case is the myths surrounding Euripides and she has a number of modern ones too. A perceptive article on the recent spate of biopic movies shows that to a movie they all attribute the genius’s insight to loss of love. It must be a love affair that motivates the writing; nothing else will do, and in the case of a woman, she must be helped, inspired by the man she loved. Shakespeare in Love. Moliere. Dear Jane led to write by Tom Lefroy. This one did show these paradigms in spades. Jane is different and thus alone so must be unhappy. Jane must have been in love and lost and thus we see where she got her stories. Still I think it better than that; smarter. It seemed to suggest she was unhappy beyond this simply because she was dissatisfied with the choices offered her, whatever these were. She urges Fanny to marry, but she herself won’t take what’s on offer because she doesn’t want it. It would have been more believable as a real depiction of a real life if there had been less physical beauty all around her, but that’s too much to ask in a heritage film I suppose. 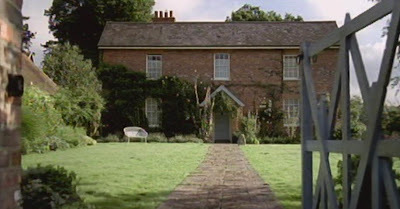 And we did get the new poverty: Austen used to be presented as richer than she was; the recent spate of films about her characters show them as much poorer than Austen imagined, and now she has come down to live in a farm-like cottage (below) with Cassandra in barely clean clothes too. But we do see that her relations with her relatives are less than comforting — too bad they had only the mother; what about the aunt? What about the uncle? And we got only two brothers. Was there some salary limit so the pathology of family life had only minimal representation? (The 07 films have all been very minimalist in budget.) It is true there is strain in the letters from the mother, and from the mother’s leftover writing we see that she was very materialistic. I’ve thought Austen was not happy in the way that’s common in lives. She had to live on a small allowance; she couldn’t travel about without a man or post (beneath her); the little evidence we have about her family, the manuscript of her leftover chapters of Persuasion and her letters show she was under some pressure to write conventionally (she had thought she was safe over the moral about the mother’s advice in Persuasion but not so, her mother resented the book somehow or other). She had to write for 3 decades before she could get anything in print, and then she wasn’t exactly getting huge sums (but then that was rare). The man who wrote back about Northanger Abbey was very nasty over it: she must give him the 10 pounds before he returns the NA manuscript and if she publishes, he’ll sue. I guess he wasn’t impressed by her connections, wasn’t afraid at all of offending her. Her close woman friend may have betrayed her (by sending the young man she was attracted to away) and then she died early (from a carriage accident); another was a governess in her brother’s house; her sister-in-law and cousin, Eliza, died before her. Her father died leaving her mother and sisters and her without an adequate income. Most of all she died young and in great pain and the sickness was a while coming on. 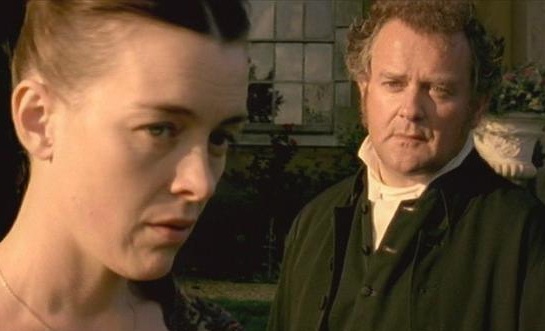 As to the specifics the film made it’s claim for — as I read the letters with common sense — there is no iota of evidence that Austen ever had a deep feeling love affair with any specific man, none whatsoever, and certainly not with Bridges (Hugh Bonneville, left) nor he for her; he did marry and had a passel of children and as far as we know did not go after Austen with his grief from the loss of her. Family members, such as Cassandra, told of a romance around 1802-4 in the west country where the man said he would meet Austen again next year but died. He is strangely omitted from the film — too vague? 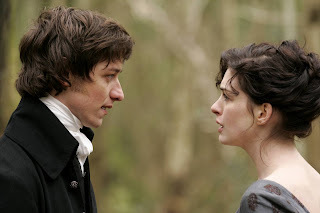 It does seem Austen had a crush or liking for Tom LeFroy and he for her, but this was easily quashed: he was sent away to make sure he didn’t get any further involved with a girl with no dowry, a fringe person who needed better connections, couldn’t offer them. The story of Harris Bigg-Wither was told by someone else, and it does have the ring of truth. None of these three is a deep romance; the two last are anything but. Reading supercarefully I have noticed that in a couple of instances when older Austen was attracted to an amusing or congenial man, like the apothecary. She jokes about the clergyman. But if there was anything serious in it, Cassandra destroyed the evidence, and the tone of the letters is such that lots of people haven’t seen anything in the couple of instances I’ve noticed. One was an apothecary, and to be sure, this writer picked that up. She preferred to write and to read and had she married it would have been all over for her. She had 3 sisters-in-laws constantly pregnant all of whom died young in childbirth. She writhed under the control of her brothers because she couldn’t travel. The story to be told is of a woman who decided not to marry because in her circumstances, it would have been a slavery forever she couldn’t stand. She regretted not being able to make more money. She writhed at dying young. She grieved over not being able to finish Persuasion properly. 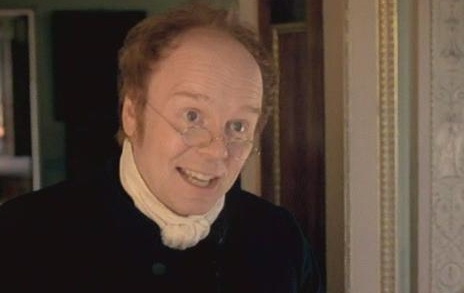 The movie does include the incident with the Regents’ librarian (Jason Watkins as Rev. Clarke at left). We see from her letters she was “taken” up by the Regents’ librarian and show the library. He was a rare literary person she met (if third rate) and he treated her seriously and it was to him she wrote a letter where she expressed some worry that Emma showed she was running out of material in a more sophisticated way than she usually discusses her work. She also makes a striking comment on how court life is a form of slavery she wouldn’t be able to stand. She did make fun of him, but she makes fun of lots of people and sometimes (frequently if we are candid) maliciously. She hardly ever has a good word for a fellow novelist. She was afraid to meet famous novelists in public arenas; she wasn’t used to it and knew she had little to make them respect her in the ordinary wordly way. So she refused an invitation to a party where she would have met Madame de Stael (Wikipedia image at right) even though (a rare instance) she praised Corinne highly (better than Milton she said). 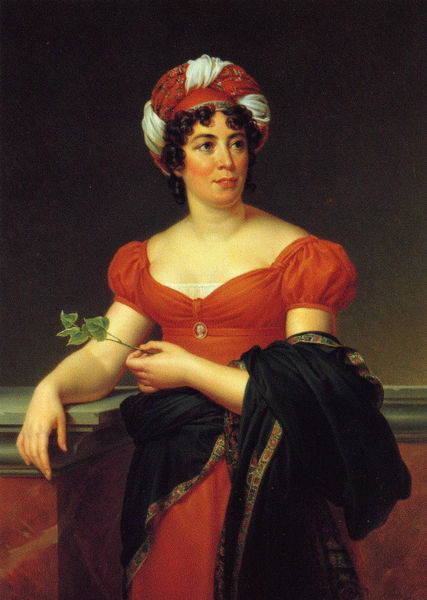 I did like how her friendship for Madame Bigeon was presented, and there was an allusion to Isabelle de Montolieu — the woman who is said to have written Raison et Sentiments. Since I have Montolieu’s text of Caroline de Lichtfield on my site, a biography and her preface to Persuasion the translation, I liked that. But why not Miss Sharpe? Where was Martha who lived with them and married Frank? Where Frank? Who I think Austen did love very much (if only as a sister probably) — at least deeply enough to make the name Frank a repeating one and have Janes fall in love with Frank clandestinely, and have sailors central to her books. Why did we not get Anna? who wrote too. Nor her nephew? Again why were so many people left out? Maybe to make the interpretation of love as central stick. I thought as a movie it held together movingly though and was intelligently done. If you know little about Austen’s life, it at least is not complacent like the old 3 part BBC “life and works” type thing, and may just lead the viewer to go back to her letters or find a decent biography. Click here for Ellen’s blog, Ellen and Jim Have a Blog Too and her main website. Inquiring readers, Ellen Moody, has been writing a series of interesting posts about Jane Austen movie adaptations, comparing several movies of the same novel. Click here to read Sense and Sensibilities Alter the Landscape of Austen Films. PBS Masterpiece Classic resumed The Complete Jane Austen last Sunday with the rebroadcast of the 1997 adaptation of Emma. My favorable review of the film sits in the post below. Ellen Moody expressed different thoughts about Mr. Knightley in her blog, Ellen and Jim Have a Blog, Too. Click here to read why she thinks there’s something odd about him. Ellen is the creator of the Jane Austen almanac. If you haven’t yet come across her calendars of Jane’s novels, click here. They are remarkably useful. Kaye Daycus compared the two Emmas in her Fun Friday review. I wonder what she’ll come up with for this Friday? As always, there’s a lively discussion going on at Austen Blog. This time it’s Emma’s turn. Join in the fun and leave your opinion. Over at Jane Austen Today, the second guest blogger, Barbara Larochelle, moderator of the Sense and Sensibility discussion group at The Republic of Pemberley, gives us her thoughts about the new film adaptation of Sense & Sensibility. I believe she likes it.